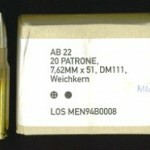 AB 22, 20 Patrone (20 cartridges), 7.62 x 51, DM 111, Weichkern”. 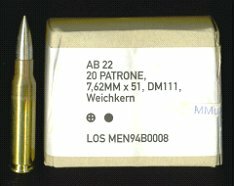 AB 22 is the design whose terminal ballistic performance in tissue is unique from most other 7.62 NATO FMJBT Ball bullet designs. 7.62MM x 51 is the calibre. DM 111 is the bullet, 147 grain soft core NATO ball (berdan primed, non corrosive). The bullets are a cupronickel covered mild steel jacketed FMJ, and Weichkern means Soft Core. Also on the box is a circle with a cross (meaning NATO approved ammo) and a solid black circle (meaning ball ammo). These below were manufactured in 1994. “The tin plating is done because the rear part of the projectile has a closure disc to prevent the emission of lead (due to environmental law in Germany). The same lead was needed to prevent barrel fouling, so the lead gases produced by the hot propelling gas functioned as a de-coppering means. The disc in the projectile’s base prevented the lead from contact with the hot gases and so with eliminated the de-coppering ability. 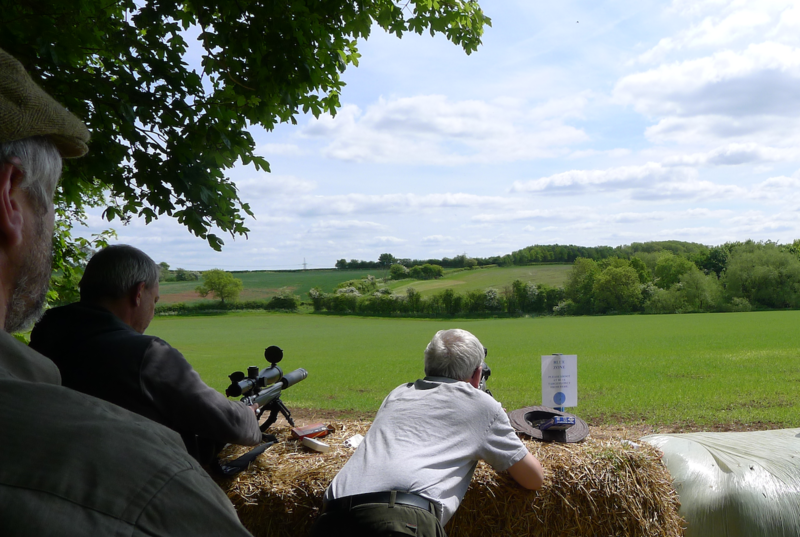 For this reason the projectile jackets are tinned, they will strip of some tin when passing the barrel and take over the function of the lead. It seems the tin is no environmental issue. The ammo is good stuff!